A comfortable retirement. The thought is something every working American has probably thought about at one time or another. Well, the Employee Benefit Research Institute believes they may have figured out what makes up a comfortable retirement. According to a recent report by the EBRI, those who take advantage of their 401(k) plan for at least 30 years should be able to have a minimum of 60 percent of their pre-retirement income when they combine the annual income from that 401(k) with their Social Security Benefits. This sounds great, however, not all Americans choose to take full advantage of their 401(k) plans and still others do not have access to these types of plans. However, the biggest issue with this finding is perhaps the fact that it is assuming that Americans will be happy living off only 60 percent of their pre-retirement income. According to The Retirement Income Gap Solution, a recent Spectrem Group report, the largest percentage of investors that are still a few years away from retirement indicate they plan to maintain their current lifestyle in retirement. 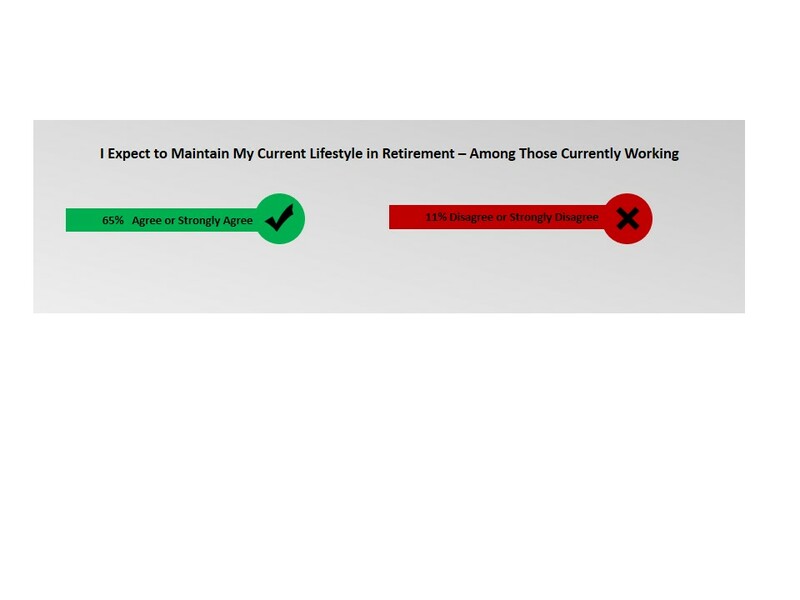 When asked to rate themselves on a scale of 0-10 (with 0 equaling “strongly disagree” and 10 equaling “strong agree”) on whether they plan to maintain their current lifestyle in retirement, over three-fourths placed themselves higher than the halfway point on the scale. Therefore, Americans don’t intend to change their lifestyle in retirement, so 60 percent of their income may not suffice. Combine this with the fact that almost half of the same group of investors indicated they plan to wait to start taking their Social Security benefits until they are eligible to receive full benefits. This means they will not be able to supplement any retirement income with Social Security until they are 70 years old. The Retirement Income Gap Solution report also finds that the majority (74 percent) of investors that are already enjoying retirement disagreed when asked if they were living below their pre-retirement lifestyle. While 60 percent of pre-retirement income may not work for most working individuals when they plan their retirement, this is not the case for all individuals of retirement age. Some may not feel the need to maintain the lifestyle they had during their working years, and for these individuals, the EBRI formula may work out just fine.